Mr.& Mrs. Andrew Hamilton and Miss Ellen Lyle made a call. Mr. Hamilton is lately from England and drove down in a very stylish London Barouche—chariot; that is to say, a chariot with lamps etc which can be thrown open so as to form a Barouche. A seat is fixed on the rear for the footman to sit in, with his face to the horses. It is a beautiful vehicle, uniting style to taste, but heavy, requiring four horses to draw it. Mrs.Hamilton in her dress was the pink of fashion, having lilac boots, with feathers and shawl to match, and her gown etc highly and richly decorated. This extravagance is habitual with her, and finery in her attire is a hobby and daily occupation with her. She appeared affable and ladylike in her manners, and looked as well as I could see through a thick veil, both blooming and pretty. 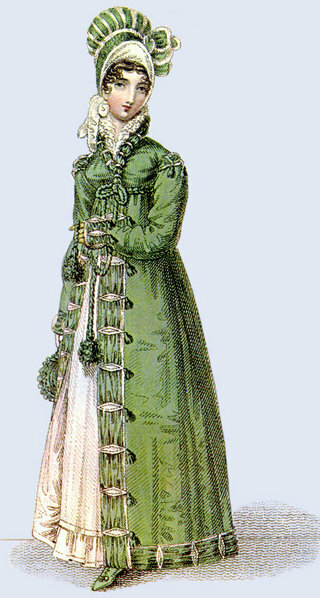 English & French fashions, 1815. The comment that she was “through a thick veil, both blooming and pretty,” with “blooming” referring again to being in the pink - of health, complexion and fashion. And what of her visiting garments? She was English, married in London and, given the arrival in the Barouche with a Footman (no doubt liveried), especially attuned to the latest in Fashion. The description says as much: She wore lilac boots, with matching feathers and shawl, and her gown was highly and richly decorated. This British dress (1816-21), from the Victoria and Albert Museum, features detailed smocking with muslin puffs and softly gathered sleeves. Given the time of year, it would have fit the description in 1818 of a decorated gown. 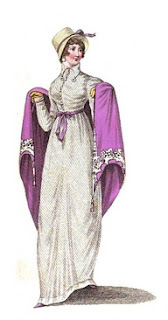 One can envision the dress, accented by a lilac shawl (see below) and the very popular half boots. 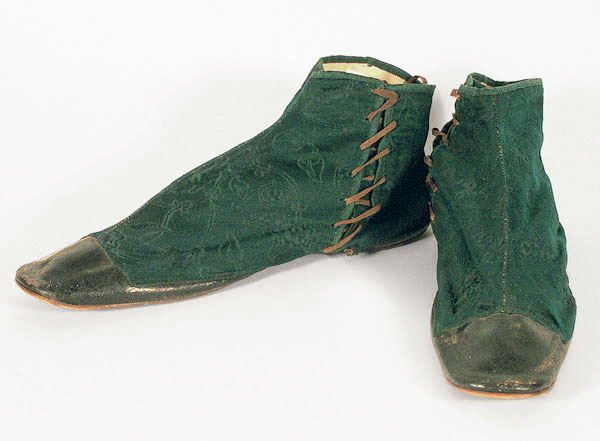 Imagine the green damask boots below from @vintagetextile in lavender, with the same shade used in the plumes of her hat or bonnet. Clearly, Mr. Breck's remark that "extravagance is habitual with her, and finery in her attire is a hobby and daily occupation" was a topic of discussion in their Social circle. 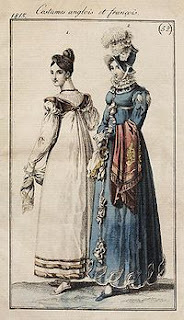 A look at fashion Plates from the Regency period, such as Ackerman’s and La Belle Assemblee, provide Compatible visual imagery to her textured and Coordinated visiting garments. 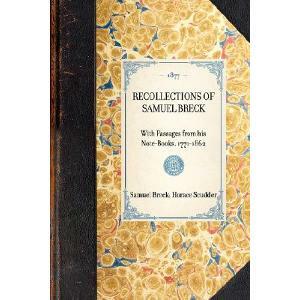 The diarist, Samuel Breck, was a Philadelphia merchant, musician, horticulturist and philanthropist. Born in Boston in 1771 into a prosperous family, he married Jean Ross, the daughter of a successful Philadelphia merchant. 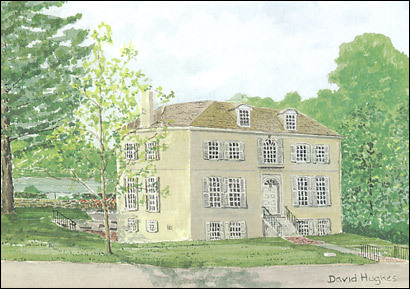 He moved to his country estate, known as “Sweetbriar” (now part of Fairmount Park, Philadelphia) and constructed a fine transitional Federal/late Georgian style house in 1797. Breck’s diary contains reference to Marquis de Lafayette and Joseph Bonaparte, brother of Napoleon, among others. Sweetbriar is open for tours by appointment only. Please call 215-222-1333 to make an appointment. totally in love with the French Walking Dress and chapeau. Absolutely agreed. No doubt it had a perfect, slight sway on the wearer. What a fascinating diary entry!